The inpatient program at the Patricia Neal Rehabilitation Center occupies 3 floors of Fort Sanders Regional Medical Center. The patients are treated in the 4 East Orthopedic Gym, the 5 East Stroke gym, the 3 East Spinal Cord Injury/Brain Injury gym and the 3 East outpatient gym with patient rooms located on 4 East and 4 West. The rooftop therapy park and ADL apartment are also utilized as needed. The current physical plant of Patricia Neal Rehabilitation Center is approximately 58,000 dedicated square feet. Patricia Neal Rehabilitation Center is dedicated to providing services to persons who have suffered a loss of physical and/or cognitive impairment due to stroke, brain injury, spinal cord injury, amputations and other neurological and orthopedic diagnoses. Patricia Neal Rehabilitation Center helps patients regain the greatest amount of independence and enjoy the highest quality of life. Services will include appropriate intervention along a continuum of care that best fits the needs of the patient from inpatient to outpatient with coordination of available community services. Patricia Neal Rehabilitation Center accepts from ages 6 and up. Patients and families are a vital part of the rehabilitation team and participate with the interdisciplinary team in developing an individualized treatment plan. Progress towards defined goals is reviewed in a weekly team conference. All patients are under the care of trained staff and a physiatrist, who with the case manager will coordinate the highly skilled team of professionals. The environment is designed to address the cognitive, physical, educational, psychosocial, and behavioral needs of the patient. Professional staff members are continually updating treatment skills and techniques to incorporate into the most effective treatment for patients. Referrals to the Patricia Neal Rehabilitation Center are received from the following regions: east Tennessee, southeast Kentucky, western North Carolina, northern Alabama, northwest Georgia, and southwest Virginia. The main referral area for the rehabilitation center is the Knoxville area and surrounding 32 counties. Referrals are initiated by physicians, case managers and patient/family requests. The Patricia Neal Rehabilitation Center has received patients from across the country and around the world. Upon receipt of the referral, a clinical liaison and rehabilitation physician will review the medical record and determine the most appropriate placement in the continuum of care to best meet the patient’s needs. Patricia Neal Rehabilitation Center admissions staff will verify insurance coverage prior to admission and are available to discuss any estimated out of pocket expense to the patient. The rehabilitation center accepts multiple payor sources: Medicare, Medicare Advantage Plans, and TNCare, Worker’s Compensation, commercial insurances, and self pay. 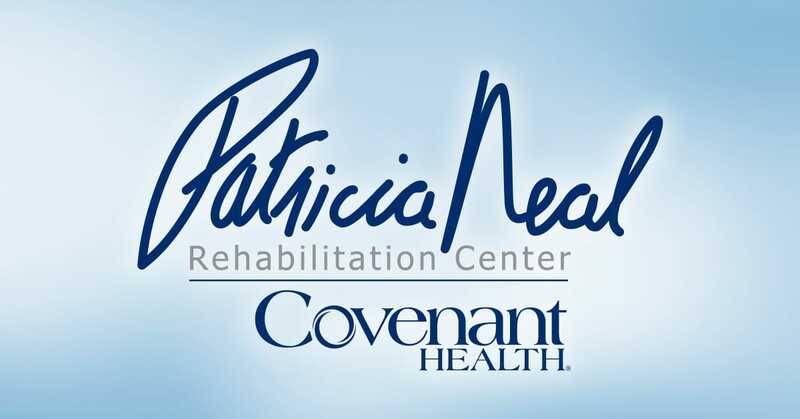 Patricia Neal Rehabilitation Center establishes its rates for service through a reimbursement analysis established by Covenant Health’s revenue process. Patients will not be eliminated from consideration solely due to lack of funding. It is recognized that the center can only support a limited number of charity cases, yet assure its own economic viability. Upon admission to Patricia Neal, each patient will undergo comprehensive assessments by the rehabilitation team. As these assessments are completed, a plan of care will be established by the rehabilitation physician that is individualized to each patient’s specific needs. Patient treatment is implemented after team members have completed initial assessments. Patients will participate in individualized treatment plans during their stay at the Patricia Neal Rehabilitation Center. These treatment plans will include 1:1 sessions with therapy staff, but may also include treatment in group settings. Specific treatments and techniques are discussed with family / significant others during scheduled training sessions. Education and psychosocial supportive services for patients and families are an integral part of the rehabilitation process. Education provided is individualized depending upon the patient and family needs. Nursing services are available 24/7. Therapy services are available 8:00am – 3:30pm, 7 days a week. A typical day for patients Monday through Friday includes 3 hours per day of therapy, consisting of a combination of physical, occupational, and speech therapy. Weekend therapy is scheduled dependent upon patient need. Behavioral medicine, recreation therapy, and case management see patients on an as needed based. All patients are followed by the rehabilitation physician. The discharge planning process begins during the initial admission interview with the patient and family. The case manager works with the team to make a plan in consideration of the patient’s goals. The case manager completes a psychosocial assessment with the patient and the family to determine strengths, weaknesses, and coping skills and makes an effective plan that utilizes the patient’s resources most effectively. The discharge plan is reassessed throughout the patient’s stay with plans and goals changed as necessary. Finalize discharge plans with the patient and significant other(s). Refer patients to services along the continuum of care such as Outpatient services, Home Health, Post-Acute services, or integration into appropriate community services. Coordinate needed equipment and services such as medication, transportation, and DME. Patients receive important information in preparation for discharge which will include: medications and prescriptions list, follow-up appointments, community resource contacts, and educational information. Case management staff will attempt to call/contact patients/families within a week of discharge to address follow up needs including recommended home equipment was obtained, prescriptions were filled, and other needs are addressed. Patients/families may also receive a patient satisfaction survey via phone call within approximately two weeks after discharge as well as a follow up phone survey in 3-6 months.